I don't know about you, but I find men the hardest to buy for out of everyone which is slightly ironic as I mostly have men to buy for each Christmas. My husband always says he doesn't want anything, my Dad is similar and my brothers can be tricky too. However, I've found that making notes on my phone throughout the year of anything they've said they like/want has made Christmas shopping this year that bit easier. 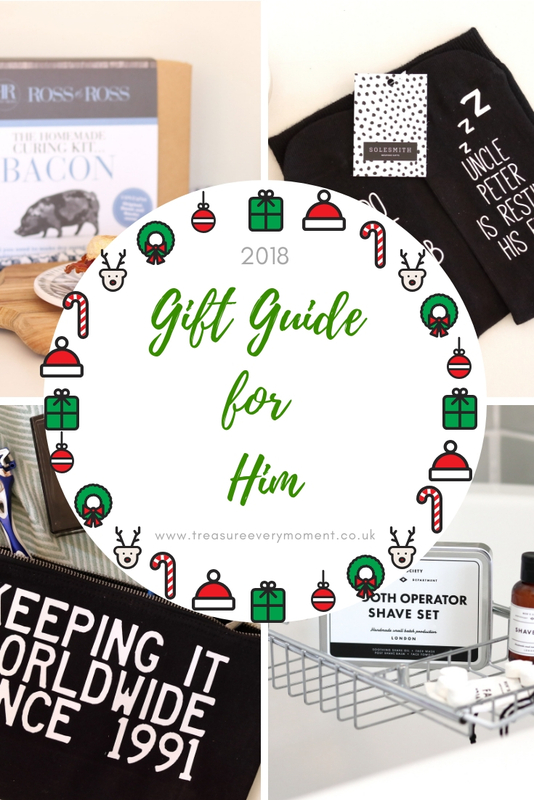 Hopefully this Gift Guide will help you with ideas and inspiration for presents for those men in your life. Personalised Smooth Operator Shave Kit (£25) from Men's Society - This natural, soothing set includes everything needed for men to get a smooth shave with the nicks and cuts, including shave oil, face wash, post shave balm and face towels. Its compact size makes it ideal for the travelling man, as it is conveniently designed to be packed into their hand luggage. All of the contents are natural based, which is kind to the skin and soothing for shaven skin. Each stage of this skincare routine compliment each other with ingredients such as grape oil, sweet almond oil and citrus fruits. You can also personalise the tin free of charge to make this an extra special gift this Christmas. Personalised Map Poster (from 39euros) from Alvar Carto - Alvar Carto is a very easy to navigate website that allows you to create unique custom-made map posters of any location in the world. Choosing somewhere special to your loved one then creating them a poster of that place is not only a thoughtful gift, but a stylish addition to any room too. Once you have chosen your location you can drag the map around until you are happy with the way it looks, then you can choose the poster style from Sharp, Classic (shown here), Sans or Modern, as well as the map colour from grey, black, white, copper or petrol depending on the style chosen. After you've created your custom-made poster you can choose the size starting from 30x40cm all the way to 70x100cm and whether you want it portrait or landscape. Lastly you can personalise the labels on the poster and it is ready to be ordered. Personalised Pouch for Him (£17) from So Close Studio - Going on holiday, travelling with work, visiting family/friends or to simply store skincare at home, this Personalised Pouch is the practical yet personal gift to give this Christmas. You can completely personalise the wording, so you can make it special for a Grandad, Boyfriend, Dad, Uncle etc. To get inspiration as to what to have on it you could browse Pinterest or directly link it to the person you're giving to, maybe somewhere they travel to loads or a nickname they have. It is also available in a smaller natural pouch, which is beige in colour and priced at £9.50. Personalised Travel Keepsake Box (£28.50) from Bespoke and Oak Co. - Treasuring keepsakes from holidays, travels, days out is such a nice way to remember those moments forever and this Personalised Travel Keepsake Box is the perfect place to keep them. The beautifully crafted wooden box comes with a world etched into the lid and then you can personalise the words that are around it, so let your imagination run wild. Clare and Andrew are the lovely people behind Bespoke and Oak Co. and their love, attention and time is poured into every single one of their creations. They also have a wide range of personalised keepsake boxes for every occasion, as well as personalised name places, crackers, wooden spoons, coasters, rounders kit, hangers and photo frames to name a few. If you are currently planning your wedding then they are really worth having a look at because their wooden wedding accessories are simply stunning. Backpack Xtra (£14.99) from Go Travel - Go Travel have created a compact, lightweight backpack that folds up making it ideal for travelling with. If you or someone you know usually takes a suitcase as hand luggage then you may have experienced a lack of bag situation at your destination. Backpack Xtra solves that problem, as you can have this neatly packed away in your luggage and when you need a backpack during trips out then all you do is unfold this. It is surprisingly spacious and is available in black, red or green. Mug Mix Bundle (£12) from Bakedin - Who doesn't love cake? Even better if it can be prepared in a matter of minutes and in your favourite mug! Bakedin only use the best ingredients in their mug cake mixes, including award winning local flour, Belgian chocolate and ground Madagascan vanilla. This bundle includes Chocolate Brownie, Chocolate Cookie and Sticky Toffee, all of which contain three mug mixes. Making a mug cake couldn't be easier and when topped with ice-cream, cream or custard it is the most delicious treat for anytime of the day. You can also purchase these mug mixes and many other flavours individually on the bakedin website. Gardeco ISON Ball Fire Pit (£149.99) from chimineashop.co.uk - Cosying up next to a fire is the perfect way to spend an even whatever time of the year. The ISON Ball Fire Pit has a striking, elegant and stylish sphere design that maximises the amount of light given, as well as the view of the fire. It is crafted from high quality steel and the clever lid design allows more wood to be easily added with the long handed tool that is included. The fact that the fire is completely surrounded when the lid is on is reassuring from a safety point of view, as it prevents any hot chunks of wood popping out at the people sitting around. Chimineashop have a wide range of fire pits, chimineas and garden accessories that can transform any garden into a haven to be enjoyed throughout the year. Wild Feet T-Rex Cotton Socks (£9.99) from SockShop - Socks are the practical gift that can certainly be fun too, especially with the wide range of exciting designs and patterns the SockShop sell. This set of three T-Rex socks are ideal for anyone who loves dinosaurs or even for a father who's child is dinosaur obsessed! Their bright colours, variety of patterns and half calf length are guaranteed to liven up the sock drawer of the men in your life. Personalised Retro Sweet 1.75kg Hamper (£21.99) from Swizzels - A wicker hamper filled with all the nostalgic and classic sweets is the dream of many and now it is possible with the Swizzels Retro Sweet Hamper. They have a wide range of hampers featuring their best selling sweets, some including a mixture while other focus on one sweet, such as their Drunstick Squashies. The 1.75kg hamper is their heaviest hamper and is filled with Giant Fizzers, Drumstick Squashies, Refreshers, Drumsticks, Giant Parma Violets and Giant Love Hearts to name a few. You can personalise the label with your own special words and change the image on the other side, creating a hamper specifically for your loved one. The Ultimate Bacon Sandwich Kit (£32) from Ross & Ross Food - You can now take your bacon sandwiches to a whole new level with your own cured meat, incredible condiments and a new skill to add to your repertoire. The Ultimate Bacon Sandwich Kit includes everything you need to cure the meat, as well as La Barbacoa by Pip's Hot Sauce and Beetroot Ketchup by The Foraging Fox. All you need to do is buy the pork and get curing! There are three different cures included within this kit, Original, Sweet and Smokey, however if you're into a bit more spice then their The Ultimate Spicy Bacon Sandwich Kit has Old English Cure, Cotswold Chorizo Cure and British BBQ Cure. It's a fun yet tasty gift to give any foodie, friend or simply someone who loves a bacon sandwich in the morning. Do Not Disturb Resting Eyes Socks (£14) from Solesmith - If you're looking for personalised, fun and slightly silly socks this Christmas then look no further than Solesmith. Their website is packed with witty, funny and thoughtful socks that can be personalised for that special someone in your life. All of their personalised socks come beautifully wrapped in a stylish cardboard sleeve along with an inspirational postcard, which really makes them a thoughtful gift to give. A lot of their socks have the messages on their soles, making them seem 'normal' until someone puts their feet up. You can buy these for either women or men and can be personalised with any name you like, Grandad, Daddy, Dada, Grandpa, Uncle etc. Some of their other hidden message socks include: 'If you can read this then please bring *** beer', 'Sole Mates Est. ***', 'Do Not Disturb *** is watching the match' and 'Daddy's Bedtime Stories with ***'. The lovely people at Solesmith have kindly given an exclusive discount code for 15% off, when you enter: HELEN15 at the checkout. 7" Christmas Pizza (£11.50) from The Gourmet Chocolate Pizza Company - Helen Ellis thought of making a pizza out of solid high quality chocolate and she's a genius, don't you think? Helen is the lady behind The Gourmet Chocolate Pizza Company, who offer a wide range of chocolate pizzas all handmade by their small team of chocolatiers in Nottingham. They use only the finest ingredients, including smooth Belgian chocolate and toppings including Belgian chocolate curls and vanilla fudge. This Christmas they have brought out a Christmas Pizza featuring a white chocolate 'Merry Christmas' plaque, a milk chocolate base, red chocolate drops, creamy vanilla fudge and milk/white riceballs finished with white chocolate curls. It is available in two sizes, 7" (shown here) and 10" for £17.50, so you can choose depending on how much of a chocolate lover the recipient you have in mind is. Personalised Wooden Calendar (£28) from inkifi - Photo gifts are the perfect way to give a personal, special and thoughtful gift all rolled into one. Inkifi have a wide range of photo gifts, including this Wooden Calendar which is a stylish addition to any desk, bedside table or room. The sturdy wooden base and clipboard style holder displays each month clearly, doubling up as a way to display your most treasured photographs. The wood is from reclaimed timber from the Welsh Forests; it's always a nice touch when you know where the materials are sourced. The photos for each month can be uploaded from either your Instagram, desktop or mobile, making it easy to showcase your treasured memories. Gooseneck Phone Holder (£9.99) from Funky Pigeon - If you or someone you know often finds themselves balancing their phone while trying to do something else then this could be the gift for them. The Gooseneck Phone Holder has a super strong clamp that fits onto tables or desks (anything smaller than 1.25") and allows you to watch videos, read recipes, take photographs, read instructions etc. without the need to hold your phone. The Gooseneck part of the phone holder can be moved around, so that you can get the perfect angle for photos too. Simoniz Socks Gift Set from either Tesco or The Range - This is the gift for the car lover in your life, as the set contains all that is needed to have a car shining in no time. This Gift Set from Simoniz has a mini Shampoo & Wax, mini Gloss Dash Shine, mini Back to Black Tyre Shine and Simoniz branded socks. The mini sizes make them ideal for keeping in the car and/or for cleaning certain areas of the car quickly. Back to Black Tyre Shine and Gloss Dash Shine are both in cans, so dispense with ease and speed, making it simple for anyone to be 'car proud'. Which is your favourite gift for him this year? Would it be bad if I bought the Gooseneck Phone Holder for myself, and then proceeded to, er, borrow it!? I always find it hard to buy for men, so hands up for ideas! Love it. I have to admit I would love a fire pit for our garden, wonder what Ash would think if I got him one. Great ideas here, thank you! I love the map and socks. Oh wow what an amazing gift guide with so many fab suggestions! I love the look of that back pack! My husband would like that! What a lovely selection of gifts. I know that my other half would really appreciate that fire pit! I have a husband and four grownup sons to buy for and I agree men are difficult. Mine hate throwing any thing away so they never seem to need any thing. Your gift guides are just the best I have seen! You need to carry them on after Christmas for every event possible! I think my husband would be happy with everything on this, I would happily steal some of those sweets in the hamper! Such fab ideas! My husband would love so many of these, but especially the phone holder! Great gift guide! I want most of these things for myself, lol. My favourites are the map poster and the travel keepsake kit. My daddy has a really sweet tooth so the hamper would be perfect for him! The fire pit looks cool too! I love your photography x And I’d like lots of those gifts for myself!! Love the items here. Great ideas for gifts for the men in our lives. What wonderful gift ideas. I love the map in particular. Some really great ideas shared here, we have the map from Alvar Carto and love it, the keep sake box would definitely be a hit in my home.